A wedding is an incredibly special occasion for all involved. Two people tell the world their intent to become life partners. On this day, they will no longer be two separate people. Instead, they are a couple with shared interests and a shared life. Many couples want to start off their married lives with a wedding that brings their innate joy in becoming married to their closest friends and family members. They want their guests to enjoy the wedding as much as they do from start to finish. A great wedding location is an essential part of creating a memorable, wonderful, remarkably fabulous wedding day. When it comes to finding that ideal beach wedding location, couples need to take many varied factors into account. This includes the budget, it also includes other details that make any wedding an incredibly fabulous day. You also need to think about where you are headed after the wedding and how they're going to get to their honeymoon destination. Or you might want to create a wedding celebration over the course of several days, rather then a single day, this lets everyone involved have time to relax and prepare for the event. The right location also makes a wedding stand out from other weddings. These are just a few of the reasons why couples have turned to Phang Nga for the private beach wedding of their dreams. The average cost of a wedding in a western location can easily run to thousands of pounds / dollars. This is a significant sum of money for many newlyweds, when they're just starting out in life, the last thing they want to do is rack up a lot of debt and spent lots of money on their wedding destination. Couples want a wedding venue that's beautiful. At the same time, they're also looking for one that won't break the bank. A wedding on Natai beach in contrast, is much less expensive. Unlike some other destinations, this one allows people to have a great location that welcomes guests and still have some change in their pockets. While a wedding in the west can cost as much as a deposit on a house, a wedding in Phang Nga costs only a fraction of that. 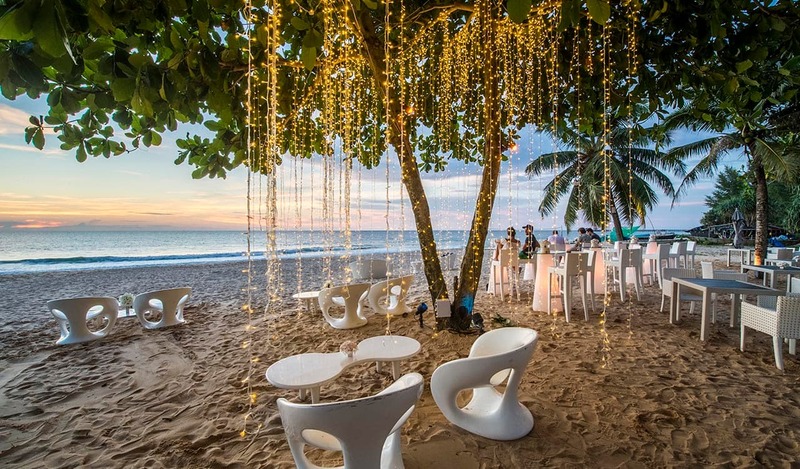 A private beach wedding in Phang Nga can also fit into any budget the couple has in mind with ease. Given the relatively low base cost of a beach wedding here compared to other locations, couples can choose to treat themselves and their guests to all sorts add-ons that make any wedding an incredible treat for each everyone. For most couples, the right location is one that reminds them of all the pleasures they love in life. They want a location full of lovely vistas with an incredible background that makes the ideal backdrop for their wedding pictures. They also want a location that will amaze their guests when they see it. A beach wedding offers the couple the opportunity to bring the wow factor to their guests. The beaches in Phang Nga are some of the most beautiful in all of Thailand, and one of the world's loveliest locations. Travellers come here for many reasons including to appreciate the region's intense physical beauty. 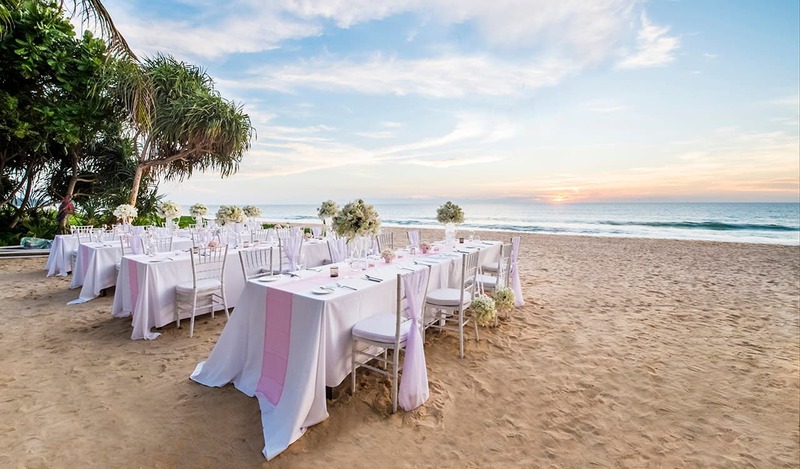 Brides and grooms can find pristine stretches of sand, gentle waves and marvellous sunsets. At the heart of any wedding celebration is good food. A vast array of authentic Thai dishes awaits any couple and their guests. Thai food is just perfect for a special feast. Over the centuries, Thais have learned to make the most of their natural resources. The net result today is a cuisine that is widely regarded as one of the world's best. Guests can take advantage of this time and sample food they've never tasted before and have the chance to embrace a whole new world of flavor. A honeymoon gives the couple a chance to get away from their ordinary lives and find a place where they can relax into married life and get to know each other even better. Becoming a married couple is a major life event and one that will impact all they do for the rest of their lives. Part of wedding planning is planning the honeymoon and to have a honeymoon in a place that lets them enjoy a break after the many months they've spent working towards their big day. A Phang Nga wedding is an ideal way to have the wedding and the honeymoon in the same space. Rather than having to spend lots of time planning the wedding and then even more hours deciding on the honeymoon location, the couple can have both in the same place. Take full advantage of the area's many wonderful attractions and resort amenaties. Classes like yoga enable couples to let go of all their accumulated stress and learn techniques for stress reduction they can use all of their lives. A romantic honeymoon package comes with everything from wonderful breakfasts and dinners to the opportunity to rest under the skilled hands of locals experts in the art of couples massage. Explore this magnificent area on their own or as part of a group. When not admiring the region's many amazing sites, they can retreat to their own private personal space. Spend one day white water rafting, followed by a beach day with a trip to the spa. A destination wedding at this location means endless variety and endless opportunities for couples to make amazing memories. A wedding is a once in a lifetime celebration and akyra Beach Club Resort makes the ultimate wedding destination and dedicated wedding planners means having the time they want with friends and family. Guests can arrive for the wedding a few days before the actual marriage takes place. This lets everyone have the time to participate in all sorts of activities related to the marriage. Old friends can get to congratulate the couple and share their favourite memories while making new ones. Couples can create a series of activities that everyone can enjoy just as much as they enjoy the ceremony and reception. And no one has to worry about last minute details such as flower delivery or making sure the driver knows how to get from the wedding ceremony location to the wedding reception. Instead, couples and their guests have the wonderful gift of time. They have the time they need to get mentally, emotionally and physically prepared for their upcoming nuptials. They also have days of support from their loving friends and family. A personal private beach wedding on Natai Beach, offers everything every couple needs for a wonderful wedding.